The verdant Vivekanandapuram campus spread across 100 acres of coastal Kanyakumari has been enriched by the ₹15-crore ‘Ramayana Darshanam’ exhibition complex. The entire story of the Ramayana has been narrated through murals and oil paintings in the complex. Vivekananda Kendra organized a Spiritual Retreat from 4th to 10th February 2018 in Vivekananda Kendra Training Centre. 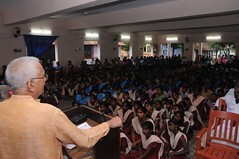 There are 41 participants, 14 in English Shibir and 27 in Hindi. Vivekananda Kendra NARDEP is working in the field of development and conservation of Natural resources since last 1986.